From the estate of a descendant of A.S. Haynes. Haynes held a number of positions in the colonial administration of the Straits Settlements from 1901 to 1934, including that of Acting Colonial Secretary (Straits Settlements) and British Resident, Perak, after which he retired back to England. This very unusual necklace comprises 17 hollow beads each with a frame of gilded, twisted silver wire in-filled with tiny silver panels that have been delicately overlaid with tiny pieces of kingfisher feather to give the beads their blue colour. Small segments of red also are visible on the beads. 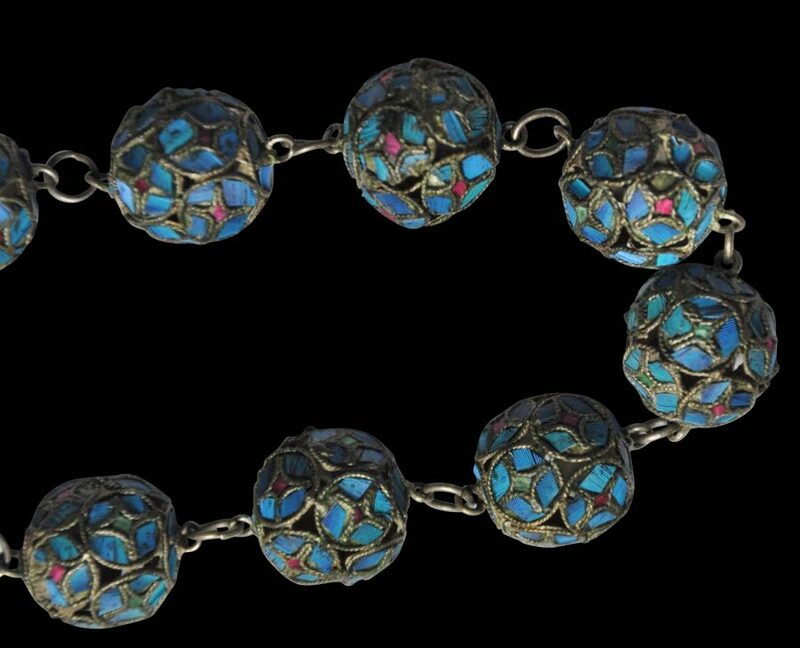 The beads are linked with silver chain. The necklace no longer is long enough to be worn comfortably on most necks today but the ends could be readily extended with additional chain. Otherwise, the necklace remains an interesting collector’s piece. Unusually, most of the kingfisher feather is intact with only minor losses. The use of kingfisher feathers to decorate ornaments in China was a practice that continued for centuries. The best feathers were sourced from Cambodia and it is believed that at least some of the wealth that led to the construction of Angkor Wat in Cambodia came from the kingfisher feather trade with China. Jackson, B., Kingfisher Blur: Treasures of an Ancient Chinese Art, Ten Speed Press, 2001.